Whether you wish you could participate in more social activities with family and friends, be more focused and efficient at your job, spend more time enjoying your hobbies, or just feel like your days belong to you—not to your migraine or to medication side effects, eNeura may be able to help. eNeura provides the unique combination of state-of-the-art therapeutic technology and knowledgeable personal support from our eNeura Migraine Care Team of Customer Care, Clinical Education Specialists, and Access Consultants. We want to help you take your life back from migraine. Talk to your doctor about the world’s only safe, clinically proven, non-drug migraine treatment with none of the side effects associated with medications. eNeura has worked to make treatment with the innovative sTMS mini accessible and affordable for as many migraine patients as possible. Once you have a prescription from your doctor, eNeura Access Consultants will help you get the best possible insurance coverage or payment support. Follow the simple steps below to get your treatment started right away and make it as successful as possible. 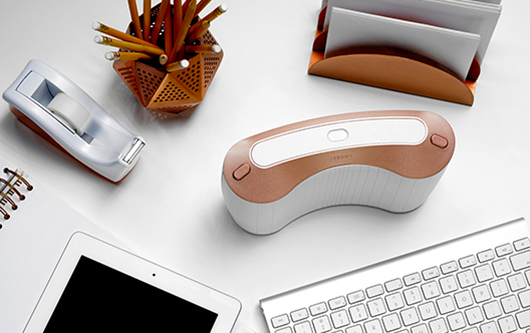 Ask your headache doctor about the sTMS mini by eNeura, or contact Customer Care to find a specialist near you. If the sTMS mini is a good option for you, your doctor will submit a prescription request to eNeura. You will receive a 3-month rental agreement for the sTMS mini by email. Fill it out and return it to eNeura Customer Care. When you receive your invoice, return it with payment. If you have questions, call Customer Care. Your sTMS mini will arrive within just 3 business days after payment is received. As a first-time eNeura patient, you will automatically receive a $300* discount on your first rental period (Regular price is $750 for 3 months). eNeura provides one-to-one support as you begin using the sTMS mini. You’ll receive a phone call from one of our Clinical Education Specialists to answer questions you may have about your sTMS mini, and to walk you through your first treatment, step-by-step. You’ll find that it’s remarkably simple. During your first 3-4 months of treatment, your Clinical Education Specialist will continue to support you with your treatment plan, answer your questions, and report your progress to your doctor. Press the center button to turn on the sTMS mini. When the green racetrack is fully illuminated, you’re ready to treat. Hold the sTMS mini so it cradles the back of your skull. Press one or both of the treatment buttons to deliver a safe therapeutic pulse. More clarity, less “fuzzy” days, fewer headache days per month. As with any medical treatment, the time it takes to feel results and the overall effectiveness of treatment with the sTMS mini varies from patient to patient. Tracking your success will help you provide your doctor, your Clinical Education Specialist, and your insurer with the information they need to evaluate your progress, monitor symptoms, and ensure maximum effectiveness of treatment. The sTMS mini Online Migraine Diary is free, easy to use, and takes only a minute or so to fill out each day. You’ll receive an access code for your diary shortly after the sTMS mini arrives. I experience 30% fewer headaches and my pain levels have decreased 40%. The sTMS mini will deliver treatments only when a SIM card with your prescription information is properly inserted and has not expired. When you first get your device, it will be ready to use; your initial SIM card will already have been inserted. Contact eNeura Customer Care when it’s time to renew your prescription. A replacement SIM card will be sent by UPS, along with simple instructions on how to install it. The eNeura staff are available toll-free to answer your questions about prescription renewal available discounts (855-366-8355; select Option 1 or email customercare@eneura.com). You can also find details in the Instructions for Use for your device.